Update: Arabic iPhone OS 3.0 Picasa web album. The iPhone 3G is currently available in 4 Arabic speaking countries: Saudi Arabia (Mobily), UAE (Etisalat), Egypt (Vodafone and Mobinil) and Jordan (Orange). Wow I’m so pleased they finally arabic to read AND WRITE 🙂 I used to read an Arabic paper on my last Nokia (pity iPhone didn’t support it before) but writing wasn’t much fun. Can’t wait. I can’t wait for this update !! the images looks great too they have done a great job .. Thank you so much for this good news. Well I just bought Iphone 3G 16GB but still having problem in sms and arabic interface. I really like this new OS. Please could you tell me what is the release date for final version. I tried iphone os 3.0 beta 5 and it seems it supports Arabic, but when I tried with Safari not every Arabic letter is written correctly. For example: the word Bi’ar, because the letter ba has kasra, hamza will be written on top of ya without dots. I couldn’t write hamza, the only alif I could write is the standing alif. Do you know how to write the other forms of hamza? There is a bug as well related to kassra, dumma, fatha â€¦.etc. For the hamza characters, etc…. You actually need to HOLD on the ALIF and then you can slide to the selection you’d like. Ok i have littel question, does the 3gs iphone supporting arabic offecially??? yes, Arabic is added with 3.0. and iPhone 3GS comes with 3.0 software. 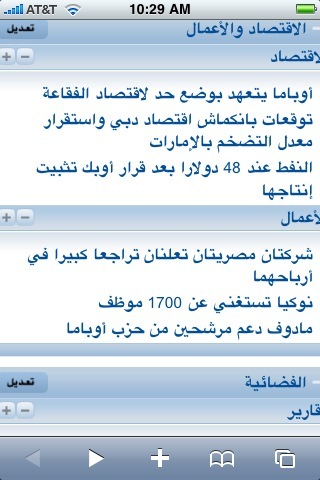 Pingback: Saudi TechView » Finally, Arabic on the iPhone!